Remember this Finding Nemo Inspiration Board? 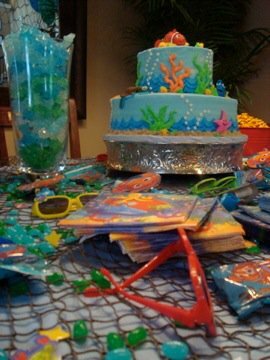 Nicole, mommy to the birthday girl, Presley just sent me pictures of how everything turned out! Since they are in Nashville, I have been waiting patiently to see the pictures. It turned out adorably! My favorite detail is the rock candy in the vases! My idea was that this would look like coral and it totally does. 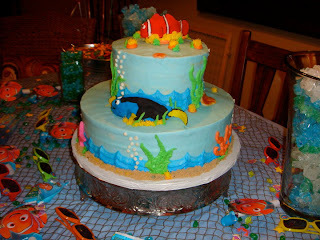 Isn't this cake the cutest thing ever?? Love the sunglasses in neon colors and the jelly beans scattered around the table. Look closely and you can see pails of Goldfish too! Super cute job Nicole! I hope Presley loved it!! That cake is precious! 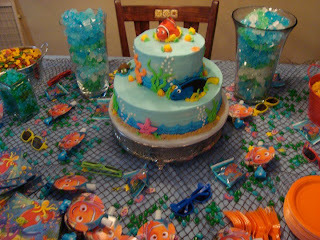 I love Nemo, such a sweet movie. And made for an adorable party. Very cute party, love the rock candy idea! she did love it! the kids loved the rock candy as party favors too and everything you sent was amazing!!!! thank you!!! !